The German heritage in Schleswig can be seen in the designs of the buildings on Main Street. A local medical clinic serves as a satellite office for a doctor and dentist. The city park features a swimming pool, tennis, volleyball and basketball courts and camping. 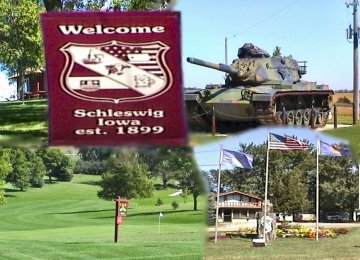 Schleswig has a nine hole golf course where several tournaments are held each summer. Activities such as 4-H, Little League, and Community Club are available to our residents. The first weekend after Labor Day finds residents hosting the annual Calf Show. For a little touch of Germany, give Schleswig a try.